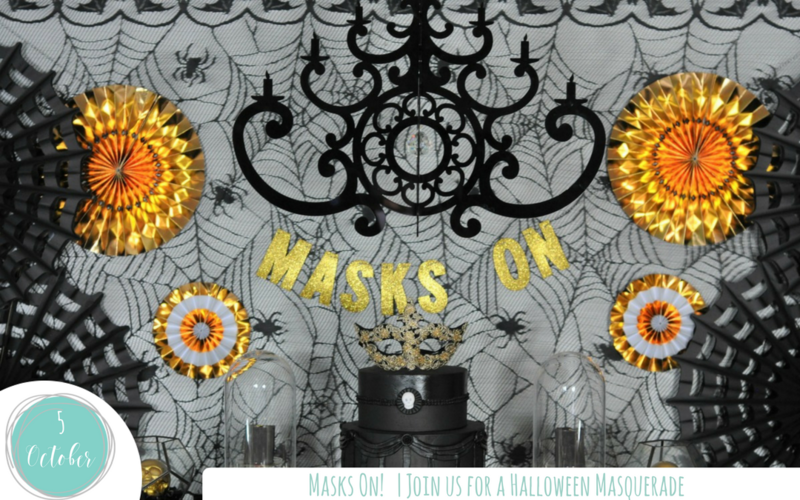 If you are looking for a glamorous way to celebrate this year’s Halloween festivities look no further than this Halloween Masquerade! Prepare your mask and arrive with an air of mystery, this glamorous party that will be sure to send thrills down your guests’ spines! Prepare your mask, arrive with an air of mystery, we welcome to the Masquerade! This glamorous party with spook-tacular printables by my partner in crime Elena of Worldwide Party will be sure to send thrills down your guests’ spines! I was inspired by a classic Halloween palette of black with gold highlights for my midnight masquerade! I love the modern and chic look of this combination! I started with the dessert table backdrop. I hung a large lace spider web backdrop. This is actually a large tablecloth that I picked up last year at Target during the after Halloween clearance. On top of this, I added bold paper rosettes, black spider web rosettes and used gold glitter letters to spell out “Masks On” – I’m not bossy at all, wink wink! In front of this backdrop, I hung a glamorous black acrylic chandelier from Chandelier By NK. It’s super lightweight and ever so elegant so there are no issues hanging this from a temporary hook. On the table in front of this, I set up the dessert table. I used a lush and elegant black velvet as the table cover, with a black sequin runner. On top of this, I used black lacquer boxes and gloss black cake plates as risers for stylish displays. On top of the boxes, I placed rich chocolate desserts under gold and glass cloches. On top of the glossy black cake stands, I placed black terrarium’s, one of my new favorite finds over on Oriental Trading. Inside I placed acrylic black ice and a gold skull. Flanking these scorpion skeletons sprayed gold. The finishing touch a gorgeous black cake with a mask on top. Would you believe this is a fake cake! If you want the fancy look but don’t plan on serving the cake as dessert you can get it. I had this one made by Confection Deception and I love it! So versatile for other events too, where the event is to small for the big cake. I get to keep the stylish centerpiece. I have a black table that I added a sequin runner too. Each guests’ place setting included a fancy black dinner plate with a gold skull plate on top. To complete the set a matching napkin to the side with sleek black cutlery and glassware. I’m in love with the skeleton hand glasses! Holding hands with skeletons over dinner! eeeeeee! The last details added are to emphasize the theme, a masquerade ball under a fancy chandelier. I chose a chandelier place card and a gold embroidered mask on a small picture stand. I also didn’t want any guest to miss out on the fun of using a mask. In the center of the table my skeleton diva. She may have her head in a vice but that doesn’t mean she can’t party like your guests. She sits atop a black lacquer riser and wears a stylish black feather mask. I just love how she “haunts” the look! Next, I placed the menu on the table using a fun cotton reel holder with a matching skull and scattered a few gold sprayed bugs like cockroaches…it is Halloween after all! Now it’s time to dine by candlelight and then take your partner for a spin around the dance floor! All of our guests had a spooky good time at this Midnight Masquerade Party and we had a ghoulishly good time planning it! Make sure to check out our Halloween Fortune Teller Craft Party and Bug Bistro Trunk or Treat for even more Halloween inspiration! For more party details, including a detailed set-up plan, printables, shopping list and planning schedules visit Enjoius. You’ll be setting up this party like a pro in no time! Have a hauntingly happy Halloween friends!